Known as the "Bread Basket of Portugal," the Alentejo region's vast, picturesque horizons are dotted by gentle hills, fertile plains and fields of wheat. Located between the Algarve and Lisboa regions, its distance from the Atlantic makes it the warmest-weathered region in Portugal, although winters can be quite cold. Alentejo is Portugal's least populated region, which adds to the countryside's serene quality. A relaxed, calm atmosphere pervades the area, mirrored by the slow-paced and easygoing lifestyle of the region's locals. Dotting the ample landscape are large farms, small villages located on small hills, and larger, ancient towns where little has changed for centuries. Fortresses jutting out from the hills at Marvão and Monsaraz, centuries-old dolmens, menhirs and burial mounds lie undisturbed on the ground, and there is the grand castle tower at Beja, and impressive Roman relics at São Cucufate and the regional capital of evora. 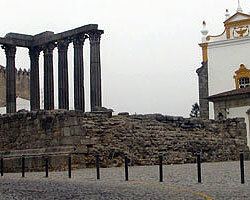 Built during Portugal's "Golden Age", Alentejo's capital evora is surrounded by a ring of fortified walls. Within its medieval walls are a very well-preserved old town centre with an imposing cathedral, structures built under the influence of architectural styles of former Portuguese colonies, and monuments dating from various historical periods including a Roman temple to the goddess Diana. There are also some tiny beaches hidden by high cliffs along the region's coastline. The Costa Azul by the south of Lisbon in Alentejo runs down to Algrave, and includes the popular resort of Costa de Caparica. The secret is now out on the traditional weekend and holiday hideaway for well-heeled Lisbon residents, the Tróia Peninsula is now gaining renown as a prime destination for international beach lovers. Some other popular beaches such as Portinho da Arrábida and Figuerinha are also located here, and are among the finest beaches in Southern Portugal. Aside from Alentejo's medieval towns and quiet beaches, the region is also making its mark in the world through its wine. Red wine from the region is gaining international renown, with many appreciating the "new world" character of its intense, fruity richness. The vineyards of Esporão, João Portugal Ramos, and Sogrape are all located within the Alentejo region.